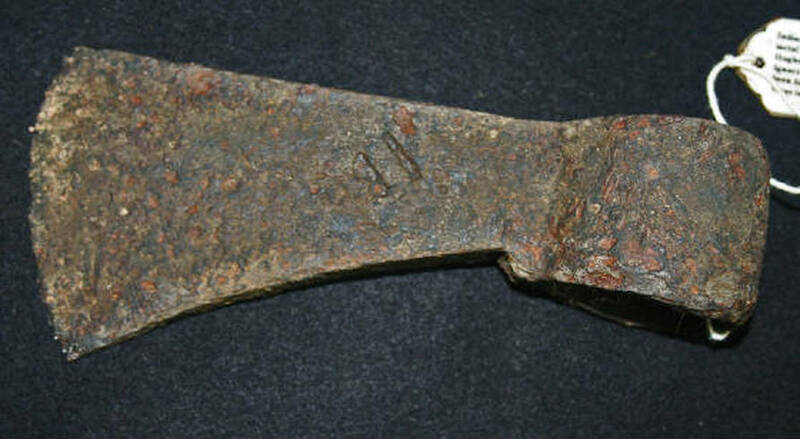 This trade axe was discovered in 1992 in 8 feet of water in Spring Creek, near Iron City, GA. next to an old grist mill. The touch mark W. MATHER on this axe is very rare-- to have a name rather than initials is extremely unusual --not to mention how well it survived for so long in water! Remnants of cloth & probably burlap remain inside the eye to help hold the haft in place. The haft appears to be Osage Orange wood, a very decay resistant wood as this find illustrates. Wrought iron back then had lots of slag inclusions in the metal which helped make it resistant to corrosion. This head could literally be sharpened again and it would still chop down a small tree after ~250 years...not that I am going to do that. Weighs 1 lb. 5.2 oz. & measures 6.25" x 3.5". 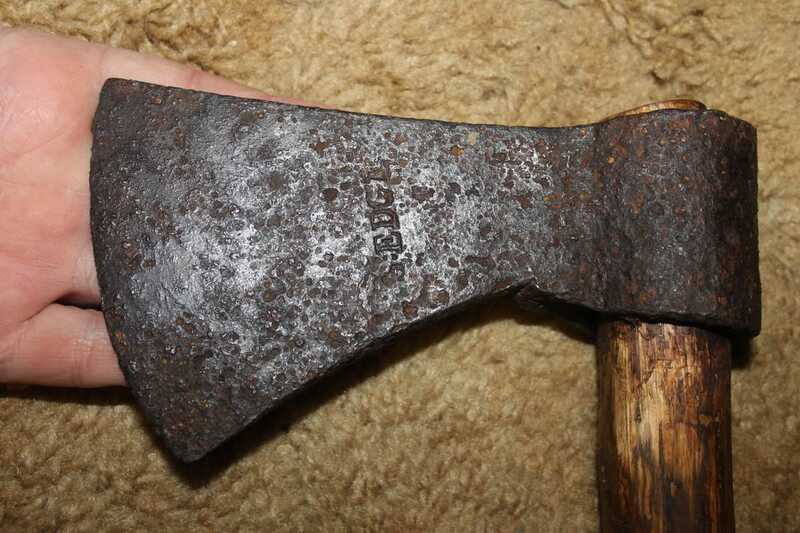 One very unusual feature is it does not have the typical notch as found on most Indian trade axes although I am comfortable it fits the trade axe category better than any other category. An identical shaped example (without the marking) is found in the Smithsonian NMAI collection collected from the Choctaw in the South Eastern U.S. The next two images are from the La Salle's French ship La Belle which sank in Matagorda Bay in SE Texas in 1687. 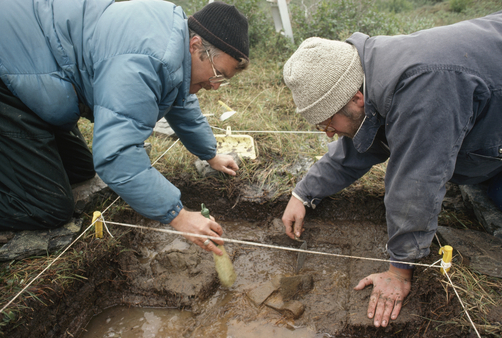 The result was an exact date that could be placed on the many trade objects recovered. 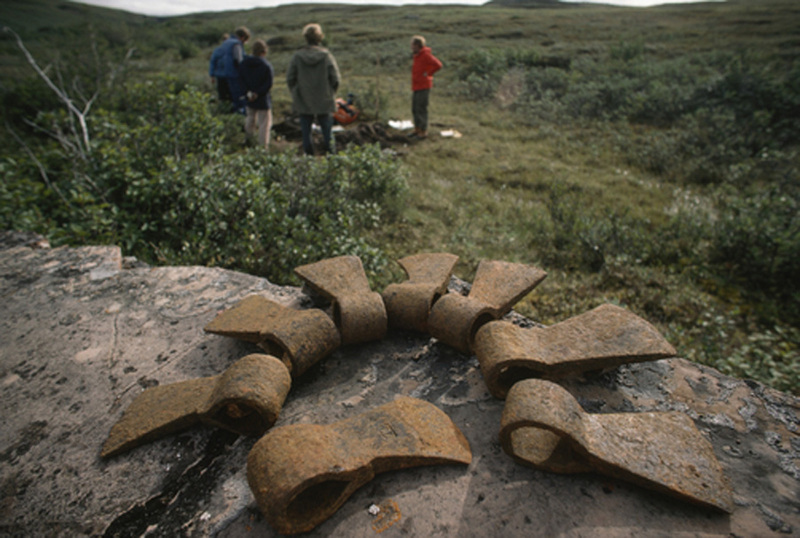 The first picture is of a barrel of trade axes to be used for trade with the Loca Indians. The 2nd picture is a closeup of some of these. 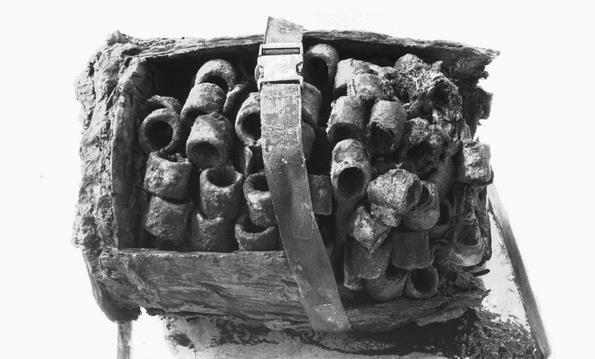 Notice the typical round polls and that they are arranged with blades pointing to the center of the barrel so the most number of axe heads could be loaded. There were a total of 576 trade axes found on board 3 barrels. No handles were necessary since they could easily be obtained by natives and also they took up too much room. The trade marks that were found on them were the letters DG, a fleur-dis-lis over the European symbol for female, asterisks, a star, a sunburst star and moon in a circle, and an impressed diamond. 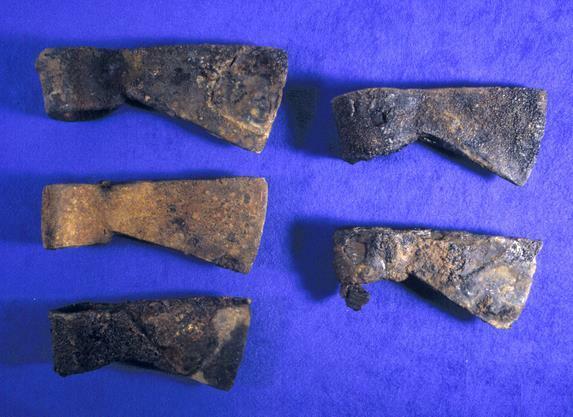 Trade axes excavated at 1821 Franklin campsite near Hood River Northwest Territories. 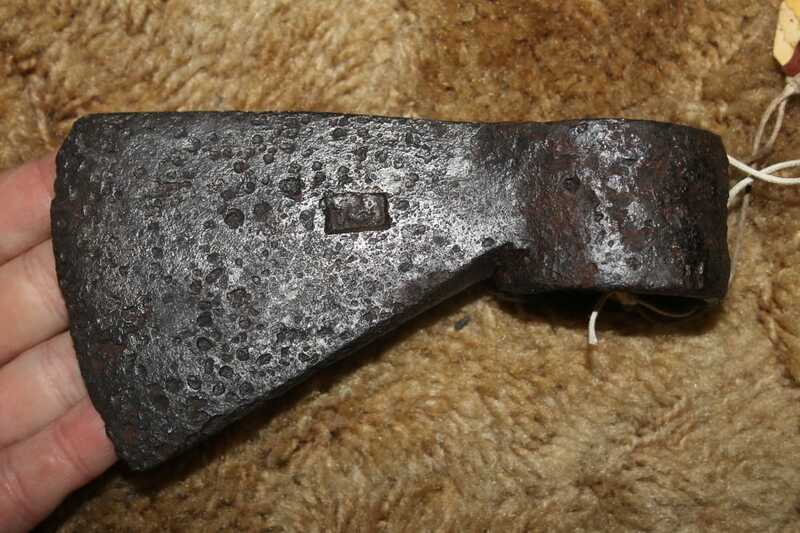 JB marked axe possibly made by John Bordeau ca. 1840 Fort Laramie. He had a forge there & was a trapper & trader. 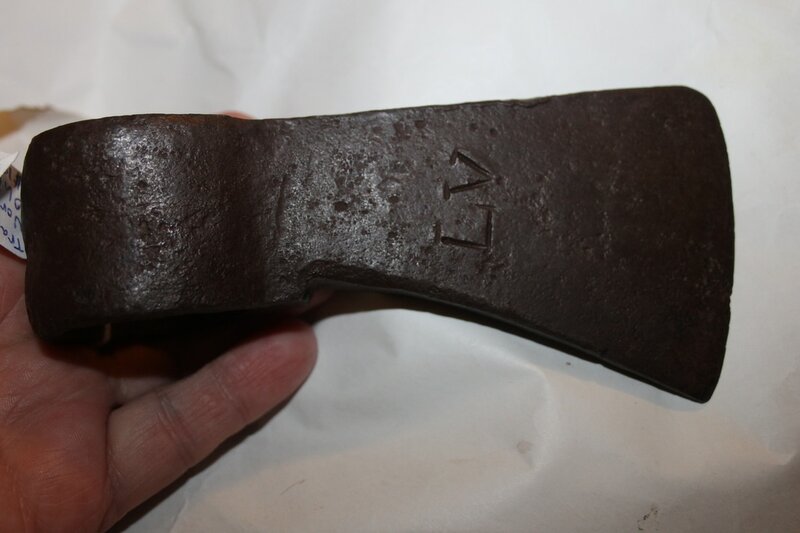 Unfortunately there are also over 10 other blacksmiths who made trade axes that have the same initials. 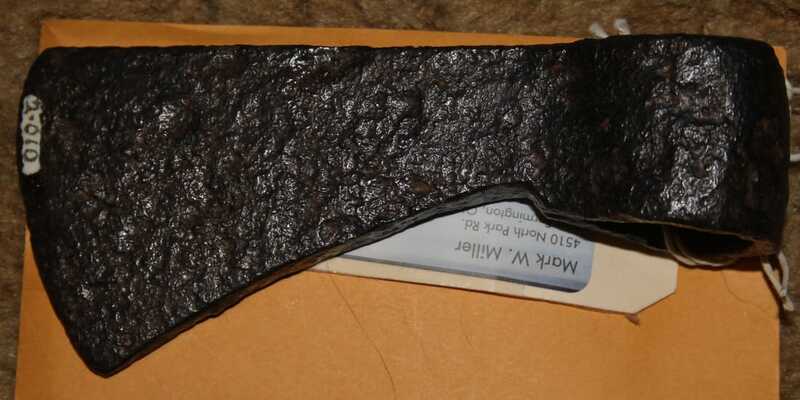 IB marked trade axe found near St. Ignace, MI. Metal detected near Ft. Michilimackinac, Michigan. Metal detected small 5" trade axe found at Fort Miller site in upstate NY. 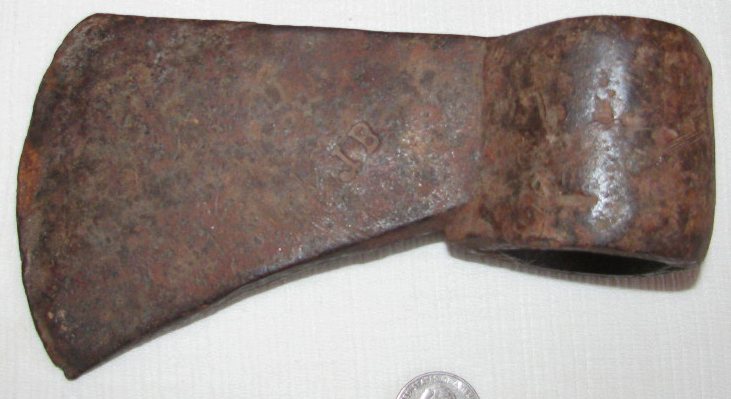 Examples this size or smaller are sometimes also referred to as belt axes. This head was metal detected near Ft. Michilimackinac with a blacksmith's beaver symbol marked. Similar ones have been found there. Here is a similar mark only this one is a six legged insect of some kind with a tail & "LV" on the other side from Northwest Ohio. ex-Kuck collection. 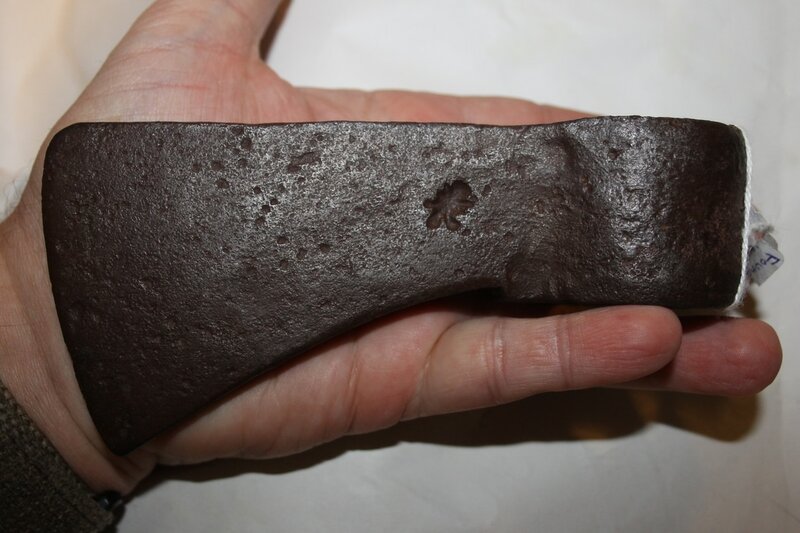 The cut marks on this trade axe indicate Indians used this as a sort of anvil to chisel out arrowheads or other cutting requiring a hard surface. 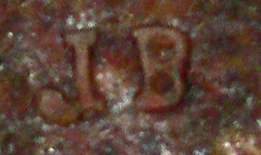 Blacksmith marked with letter "M". From Canada. 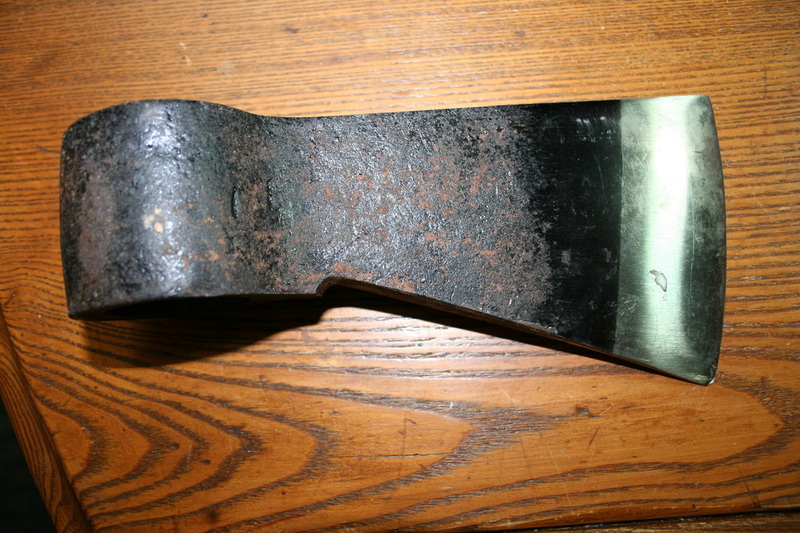 This axe came from a crate of 6 brand new axes near Winnepeg, Canada that had been painted black but were rusting through the paint. Clearly they were drop forged & machine manufactured but the round eye still held it's appeal to the bushmen of the North country. Probably 1960's or later--never used. "I have heard you intend to settle us on a reservation near the mountains. I don't want to settle. I love to roam over the prairies. There I feel free and happy, but when we settle down we grow pale and die."